Our facility has been providing quality care for the residents of Niagara since 1992. 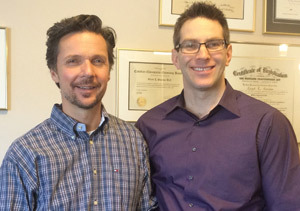 With over 30 years of combined experience, our Doctors of Chiropractic, Dr. Grant Gonchar and Dr. David Hominuk, have been focused on providing the highest standards of treatment, care and ethics to best suit the needs of the families of our community. We understand how frustrating pain is, and it’s important you know that we’ll focus on your condition and make your time with us effective and comfortable. Through chiropractic care, massage therapy, custom orthotics & acupuncture, we’re here to relieve your pain and worry. Chiropractic Care. Through a detailed chiropractic approach, we identify the underlying cause of your pain and work together to help you heal thoroughly. Massage Therapy. We also provide massage therapy to take your healing to a whole new level. Massage coupled with chiropractic care enhances the effectiveness of your adjustment, speeds up healing and ensures long-term health and fitness. We have a team of dedicated professionals who are happy to help. We’ll warmly welcome you and make sure you feel at home. We’ll take time to listen and get to know the real you and support you just like our family members. Ready to learn more? Take your first step towards healthy living by giving us a call today. We can’t wait to meet you. Providing quality chiropractic care to Smithville, West Lincoln, Grimsby, Beamsville & Wainfleet.